Download "Capacitors. 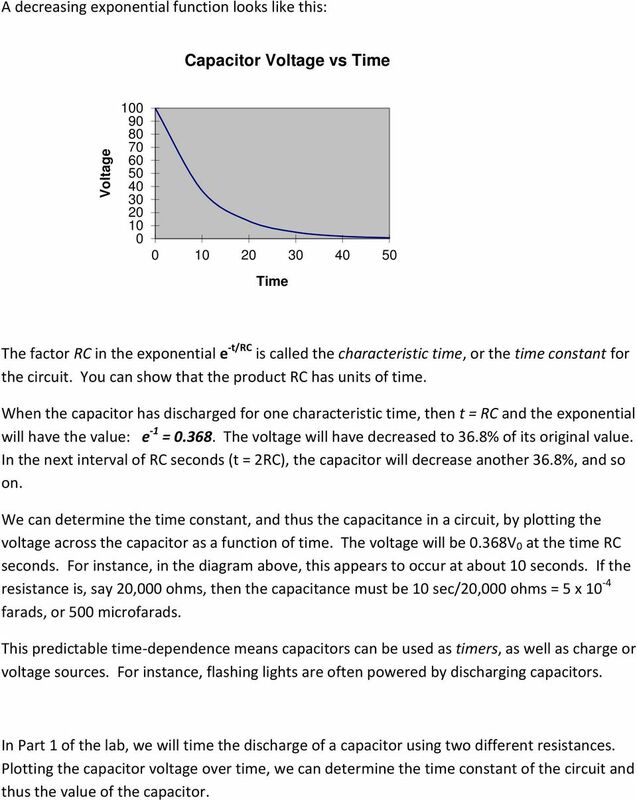 We charge a capacitor by connecting the two plates to a potential difference, such as a battery:"
4 A decreasing exponential function looks like this: Capacitor Voltage vs Time Voltage Time The factor RC in the exponential e -t/rc is called the characteristic time, or the time constant for the circuit. You can show that the product RC has units of time. When the capacitor has discharged for one characteristic time, then t = RC and the exponential will have the value: e -1 = The voltage will have decreased to 36.8% of its original value. In the next interval of RC seconds (t = 2RC), the capacitor will decrease another 36.8%, and so on. We can determine the time constant, and thus the capacitance in a circuit, by plotting the voltage across the capacitor as a function of time. The voltage will be 0.368V 0 at the time RC seconds. For instance, in the diagram above, this appears to occur at about 10 seconds. If the resistance is, say 20,000 ohms, then the capacitance must be 10 sec/20,000 ohms = 5 x 10-4 farads, or 500 microfarads. This predictable time-dependence means capacitors can be used as timers, as well as charge or voltage sources. For instance, flashing lights are often powered by discharging capacitors. 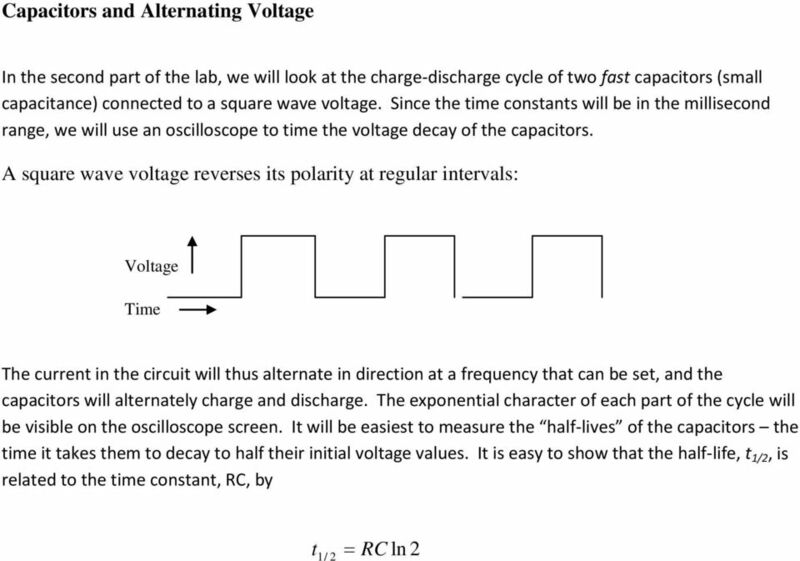 In Part 1 of the lab, we will time the discharge of a capacitor using two different resistances. Plotting the capacitor voltage over time, we can determine the time constant of the circuit and thus the value of the capacitor. 6 Procedures RC Circuits Part 1. You will perform the following for two different resistors: 1. Measure and record the resistance of the resistor. Also record the listed value of the capacitance on the capacitor. 2. Set up the circuit in Diagram 1. Note: If your capacitor has an arrow on it, connect it so that the arrow points towards the ground end of the circuit. 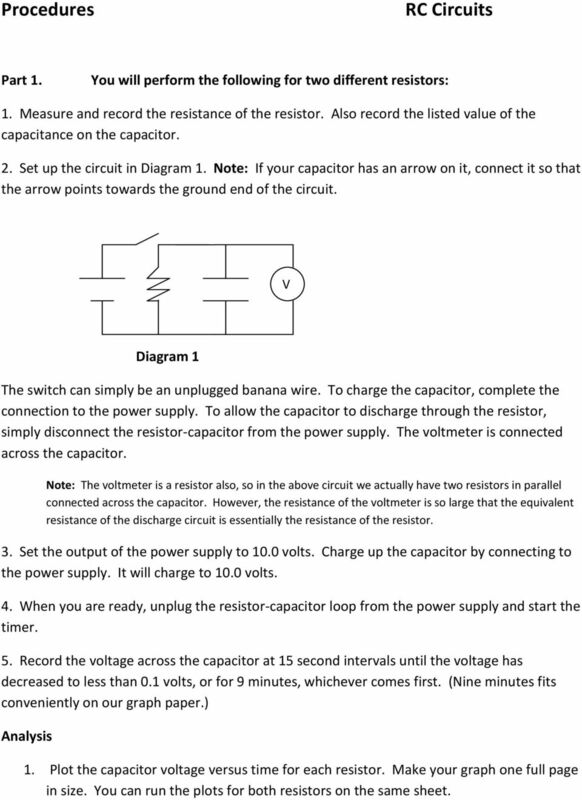 V Diagram 1 The switch can simply be an unplugged banana wire. To charge the capacitor, complete the connection to the power supply. To allow the capacitor to discharge through the resistor, simply disconnect the resistor-capacitor from the power supply. The voltmeter is connected across the capacitor. Note: The voltmeter is a resistor also, so in the above circuit we actually have two resistors in parallel connected across the capacitor. However, the resistance of the voltmeter is so large that the equivalent resistance of the discharge circuit is essentially the resistance of the resistor. 3. Set the output of the power supply to 10.0 volts. Charge up the capacitor by connecting to the power supply. It will charge to 10.0 volts. 4. When you are ready, unplug the resistor-capacitor loop from the power supply and start the timer. 5. Record the voltage across the capacitor at 15 second intervals until the voltage has decreased to less than 0.1 volts, or for 9 minutes, whichever comes first. (Nine minutes fits conveniently on our graph paper.) Analysis 1. Plot the capacitor voltage versus time for each resistor. Make your graph one full page in size. You can run the plots for both resistors on the same sheet. RC Circuits. 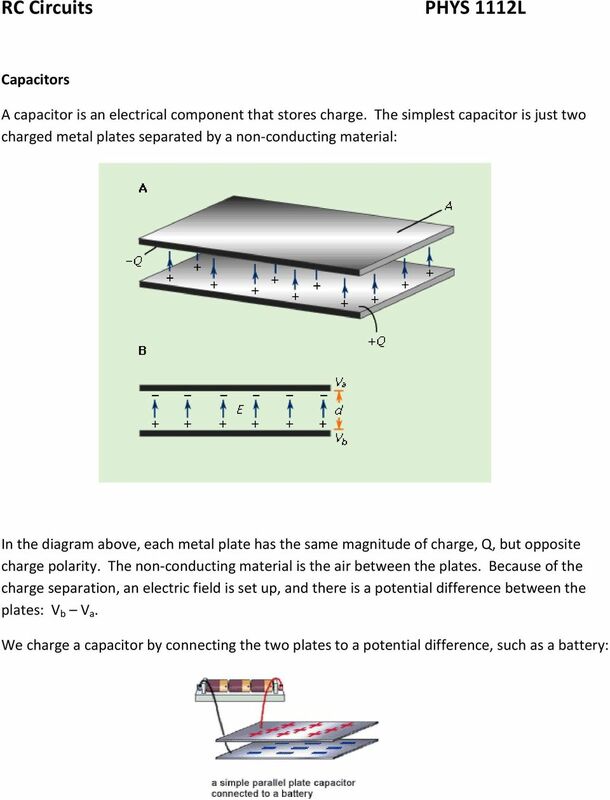 The purpose of this lab is to understand how capacitors charge and discharge. The Time Constant of an RC Circuit 1 Objectives 1. 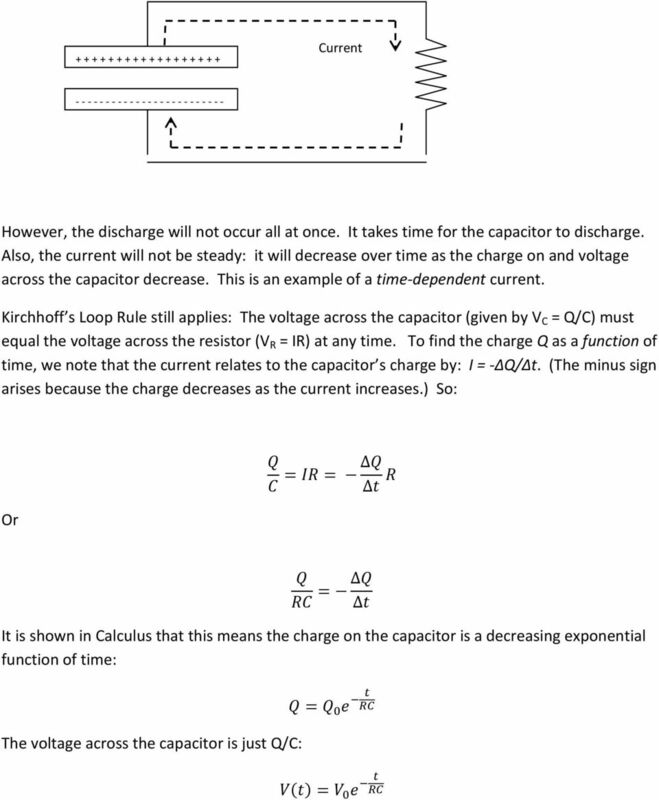 To determine the time constant of an RC Circuit, and 2. To determine the capacitance of an unknown capacitor. 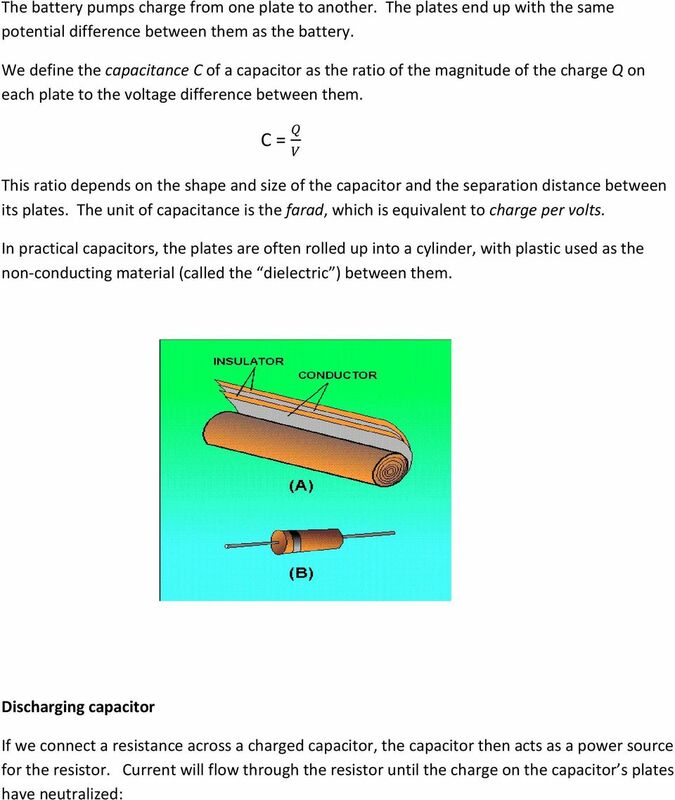 2 Introduction What the heck is a capacitor? 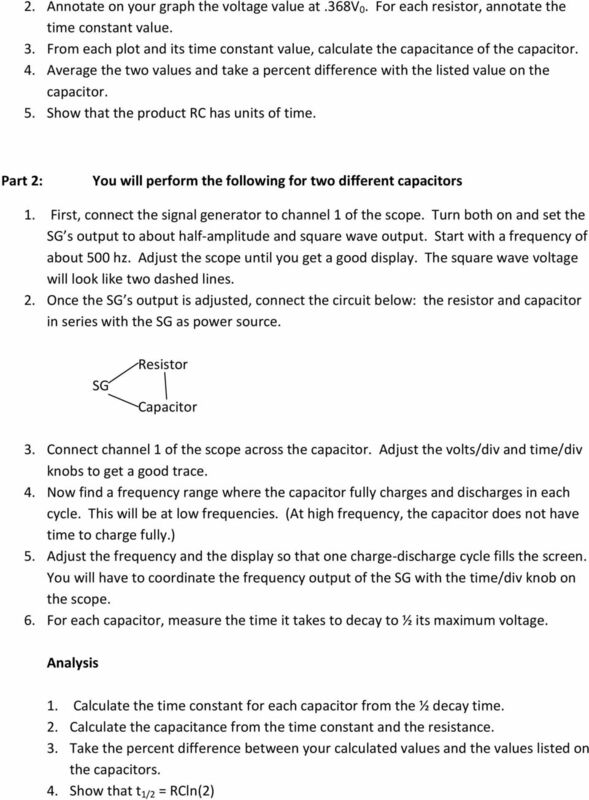 Reading assignment: All students should read the Appendix about using oscilloscopes.